One of the items that was, for all intents and purposes, erased from the memory of Wheaton College was a small little notebook in the Charles Blanchard papers. As the Archives & Special Collections has moved the descriptive information about its holdings into an archival management system (archon.wheaton.edu) staff have been reviewing box inventories and the contents of collections. One of the items that emerged was a scrapbook of clippings. Listed under “General Files” this little notebook turned out to have started out life as a baseball scorebook, circa 1868-1869, from the earliest decades of American baseball. 1869 was the year that saw America’s first professional baseball team, The Cincinnati Red Stockings. 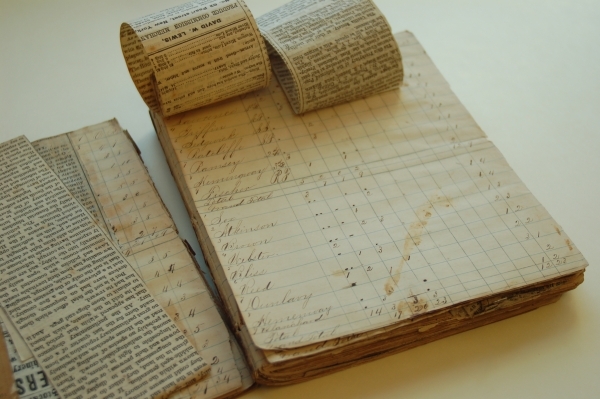 This scorebook was hidden away under pasted clippings with titles like “Temperance,” “Oddfellowship,” “The Fifteenth Amendment,” “The British Question” and many more. The obscured pages have yet to be fully revealed, due to the pasted articles, but what is easily found are some of the names of the players, the positions they played and the statistics gathered for inning by inning action. The style of the statistics follows an older “box score” format that more resembled Cricket scoring that kept track of O-s and R-s, or, the number of “putouts” and “runs.” The statistics show a very different game than we see today as players, like Blanchard, are listed as scoring ten runs in a game with final scores of 53 to 29 not out of the ordinary. In the roster section Charles Blanchard’s name appears numerous times and on one occasion we see that he manned second base. Other names that appear on the roster are Sox (a fitting name for baseball), Ramsey, Fischer, Hiatt and Bliss. Another name that appears, and has appeared in this blog before, is that of “Hemingway.” Since the earliest clippings in the notebook date from 1868, the year following the last known date of Anson Hemingway’s attendance at Wheaton, we can properly assume that the baseball player is the paternal grandfather of noted American author Ernest Hemingway. The younger Hemingway loved baseball as well and while living in Cuba erected a field and gathered local boys for two teams to whom he’d pitch. In this early baseball scorebook we see that the elder Hemingway, who later went on to work for the YMCA in Chicago, played third base. 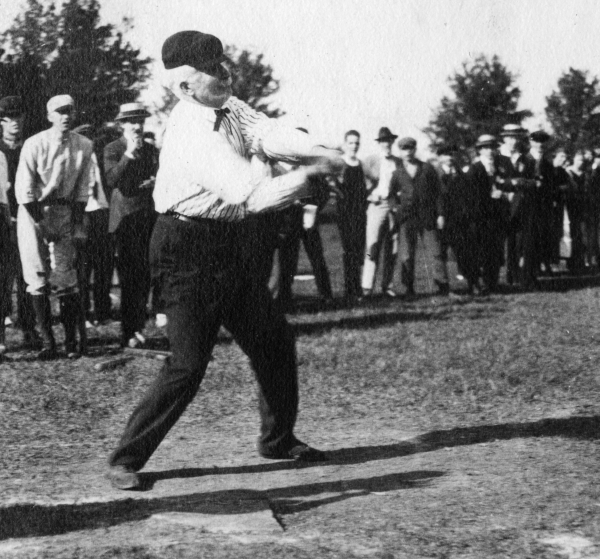 In America professional baseball is nearing its sesquicentennial and amateur play is older than that. For decades each spring has brought forth flowering bulbs and hopes for a pennant. In Chicago, for Cubs fans at least, that hope, according to Alexander Pope, springs eternal. Maybe this is the year? One could say that baseball keeps one young. Below is a photograph of Charles Blanchard at a ripe old of 72 years old giving it one more swing!